This spacious hotel in central Kolympia offers many facilities including a swimming pool, a sun tanning bed and a kids pool. Guests can enjoy the outdoors on the terrace or have a drink at the bar. Also on offer to guests are a games room, billiards and a playground. Recreational features at the hotel include a dart board. The Myrina Beach Hotel's on-premises restaurant is a hassle-free option for those guests wanting to dine in. Alternatively, there is a large range of international restaurants only a short stroll away. Diagoras International Airport is under a 40-minute drive from the Myrina Beach Hotel. 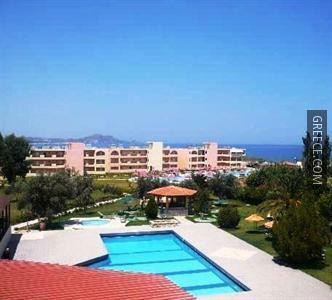 Faliraki and Lindos are both within easy driving distance of the hotel.